Cassie’s life is falling apart. She’s lost her grandfather, her mother has appeared on national TV talking about her own abusive childhood, and now her father has just moved out of their Brooklyn brownstone. So when she starts to hear the voice of E.L., a young slave girl living on a plantation in South Carolina one-hundred-and-fifty years before Cassie was born, she feels like she’s losing her mind – and nobody except E.L. is listening to her. As Cassie gets drawn into E.L.’s world, the lines between her life and E.L.’s become more blurred and her obsession with helping E.L. escape begins to take over her life. But what happens to Cassie if E.L.’s future is already written? 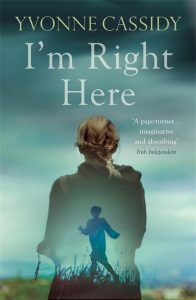 I’m Right Here is the startling and memorable story of two girls inextricably linked across time and distance. It’s a story about identity, loss and friendship and ultimately, what it means to be free.